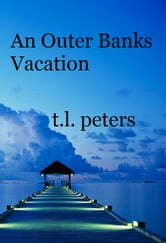 After apparently coming out on top in the rat race for partnership, an ambitious young lawyer takes a quick vacation to the beautiful Outer Banks of North Carolina. There, he encounters his long time rival, the tall and striking Loretta Allmann, who has decided that the best way to handle the competition is to kill it off. Can our hero's cute little pooch, Muffy, help him survive Loretta's murderous onslaught? Check out this 15,000 word thriller for a quick and enjoyable read. And while you're at it, take a look at Peters' two other fun and fast-paced thrillers set along the beautiful coastal region of North Carolina, Nags Head Affair and An Ocracoke Affair.